Toward a Translation Criticism is divided into two separate but interlinked parts, each focused on one element of the ethics of translation: theory (reflection) and practice (experience). 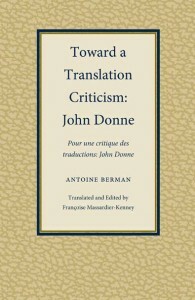 In the first part Berman presents what he calls a general “productive criticism,” while in the second part he applies the general theoretical principles of this criticism to the analysis of the translations of John Donne’s work into French and Spanish. The translation of Berman’s text is accompanied by an introduction placing Berman’s thought in its intellectual context and by supplementary notes that complete the bibliographic material presented in the French-language version. This study is essential reading for translation studies scholars, readers interested in the creative literary process, in the nature of literary criticism, andin the philosophy of language. It will also be of interest to John Donne specialists. Antoine Berman (1942–91) was a French translator, historian, and theorist of translation.